DBS Bank (Hong Kong) Limited is pleased to release the third-quarter findings of the DBS RMB Index for VVinning Enterprises (DRIVE) today. The index reading dropped slightly to 54.3 from the second quarter’s 55.2, as local companies indicated a decline in business needs for RMB in the third quarter. DBS releases findings of DRIVE on a quarterly basis, since its first launch in 4Q 2012. The aggregate survey findings from the past four quarters are taken from telephone interviews with business owners and decision makers of over 880 companies in Hong Kong. Over the past four quarters, RMB internationalisation has expanded geographically, covering Singapore, Taiwan and even London in the UK. China has also concluded a currency swap agreement with the European Central Bank. However, the lack of policy catalysts in Hong Kong, particularly with respect to increasing the size of the RMB pool, could explain why RMB usage at the corporate level remained stagnant. HKD and USD continue to be the predominant currencies for commercial transactions and trade settlement. 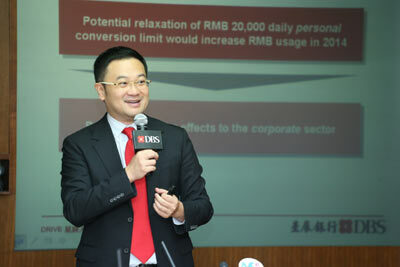 “The relaxation or removal of the RMB 20,000 daily cap on personal RMB conversion could alter the picture in 2014. Personal RMB wealth management products would flourish initially, and corporate usage of RMB would gradually pick up as the size of the RMB pool in Hong Kong increases and RMB product innovation advances,” Chris Leung said. In the past quarter, 41% of companies said they expect RMB trade settlement to account for 30% of their total trade settlement within five years, holding an optimistic view on the pace of RMB internationalisation. DBS releases findings of DRIVE on a quarterly basis. Fieldwork for the 3Q 2013 report was conducted between July and September 2013 through telephone interviews with business owners and decision makers of over 200 companies in Hong Kong.